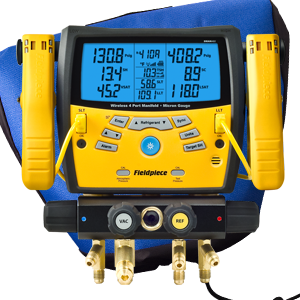 Premium Digital Manifold - Vacuum equipped 4-Port Manifold with ATC1 clamps and Hood. Coupled with the JL2 Job LinkTM Mobile System Transmitter and the SDP2 Dual In-duct Psychrometer, you get all your readings in the Job LinkTM Mobile System App as well as pre- and post-work check lists, in-depth system diagnostics, report emailing, and cloud storage for all work completed.Plus it has a built in micron vacuum gauge with gives technicians the ability to set high and low alarms, and a stopwatch, as well as view the micron rate of change. Wireless enabled for Logging, Tests & Target superheat capture.